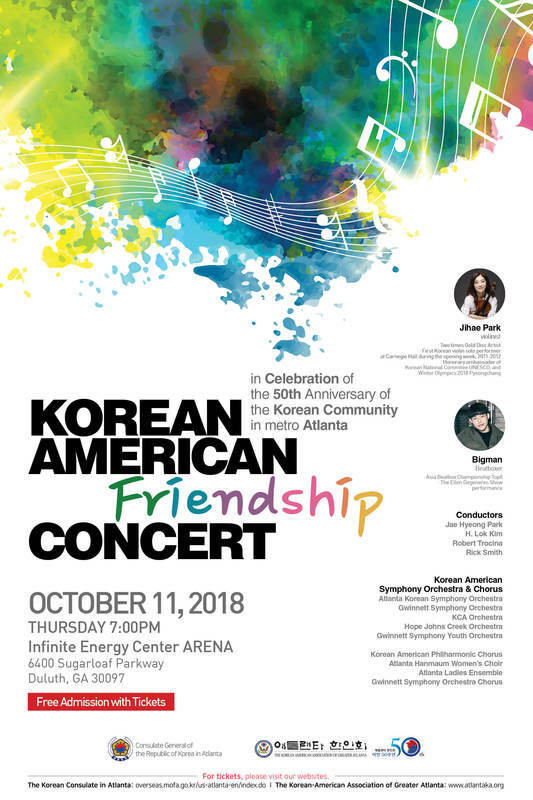 In celebration of the 50th anniversary of the Korean community in Atlanta there will be a spectacular Korean American Friendship Concert on Thursday, October 11, 2018, 7:00PM - 9:30PM. This concert is sponsored by the Consulate General of the Republic of Korea in Atlanta and The Korean American Association of Greater Atlanta. ​With famous artists from Korea and seven orchestras, this is an event you won’t want to miss. All are welcome – friends and family! Admission is FREE with tickets. Please see below for information and how to request your tickets. Have a wonderful week and thanks for your friendship and interest. - In-person: Visit the Korean Consulate in Atlanta (229 Peachtree Street NE, Suite 2100, Atlanta, Georgia 30303) or the Korean-American Association of Greater Atlanta (5900 Brook Hollow Parkway, Norcross, Georgia 30071) for complimentary tickets. - By Mail: If you request more than 10 tickets, you are able to receive them by mail. If you want to do so, please contact us via email at atlanta@mofa.go.kr. - Via Email: If you request fewer than 10 tickets, the tickets will be emailed directly to you. Please contact us via email at atlanta@mofa.go.kr.